For those of you out there looking for a break from the daily grind (assuming that’s why you’re looking at this blog and not doing whatever tasks are on your to do list…) Pinterest has introduced a new feature that will make it even easier for you to get lost in the infinite vortex of depressingly unattainable vision boards (travel plans, imaginary closets, DIY crafts, and “easy” crockpot recipes). As an unashamed Pinterest addict, as I assume 75% of all other women aged 20-30 are, I cannot tell you how excited I am for this newest development. 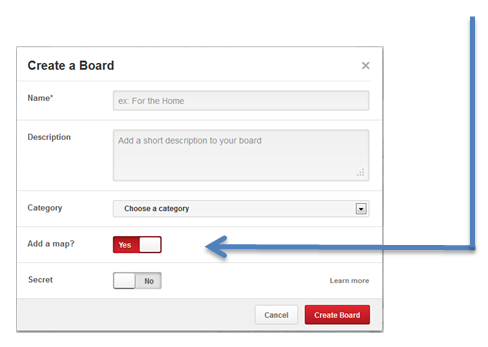 It seems Pinterest has taken a leaf from Google’s user satisfaction notebook to create this new feature. Place Pins aligns the 1.5 million daily travel related pinning habits of its users with a utility nature helping pinners relate inspiration to reality. As I am currently planning my next trip, this new feature couldn’t have been timed better. So here I go, starting my first map-able “board.” Place Pins is pretty simple to use, you create a new “board” like any other, only the first difference is to enable the mapping feature. 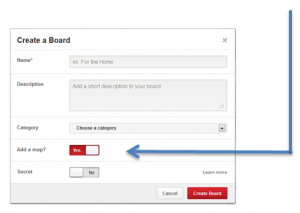 The next step is to add a place for your new board. You can set your city and type in the name of the place you are looking to pin. I’m hoping the more people use this, the better the results will be…for instance, I tried typing in several beaches, and tourist attractions that I had in mind with little success in finding an actual “place” to pin. For now it seems this is best used for physical brick and mortar destinations, like restaurants, hotels, shopping centers, etc. Once you’ve added your place you can select an image to associate with the place and pin it. 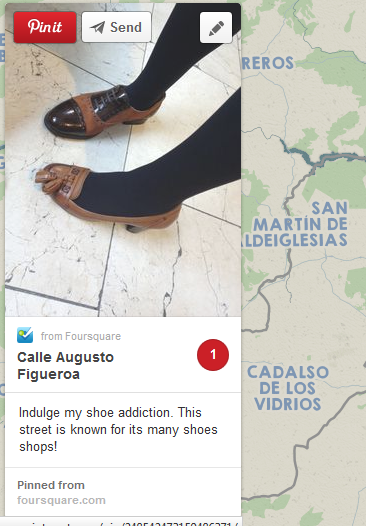 For example, I would love to “indulge my shoe addiction” while in Spain, so I’ve pinned a specific street in Spain, known for its shoe shopping! As a marketing professional, this intrigues me as a great opportunity for businesses to advertise. Using Pinterest as an advertising or social strategy is certainly not a ground breaking development, but using the map features with a physical address will definitely help promote business, particularly for those non product specific companies (restaurants, shops, attractions, etc.). As a consumer, and avid traveler, this is obviously an exciting new feature to use. I think I will need some tweaking (not to be confused with twerking) to fully function as the user will want, but all-in-all I’m sure I will waste many hours exploring and mapping my next travel agenda.